Perfectly Fits the 2019 iPad Air 10.5"
Smart Keyboard Compatible - Just wrap it all up and take with you! Signature of the artisan subtly placed in every case! A true professional is only as good as the tools at his disposal and we believe in starting with only the best tools. We took a single piece of gorgeous American full-grain leather and combined it with parachute grade stitching and a supple soft leather interior to craft this ultimate luxury leather iPad Air 10.5 case. At Pad & Quill, we aim to make each product not only durable and beautiful but also superbly useful. This led us to integrate an apple pencil holder to keep your tools closer than ever. Now you won't be digging around in your bag for the Apple Pencil when you need it. The iPad locks in place via a specially developed technology we worked with 3M to create. It is an adhesive that is completely secure, residue-free, removable, and re-attachable. Peel off the cover, line up your iPad, and press down. That's it! If you need to take the iPad out for one reason or another, no problem. Just pull from one end with sustained directional force. This means you can take it out when you need to, but it will not come out when you don't want it to either. Used by thousands of our customers, this is truly the best of both worlds! Not to be overlooked is the convenience of the built-in stand for horizontal viewing and also for a comfortable typing angle. The interior also features a leather portfolio style pocket for stashing papers and cards, and the cover is a smart cover that has a magnetic on/off feature for the iPad. The Oxford is compatible with the Smart Apple iPad Keyboard. Keeping it closed is a Moleskine style elastic strap. The leather will age with use and become more beautiful with time. Each artisan places their signature subtly inside, and we guarantee the work for 25-years! 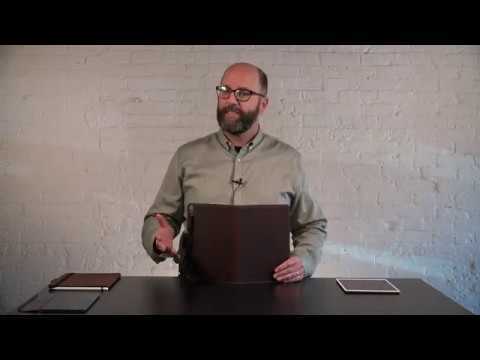 All of these super useful features make this the ultimate leather case for iPad Air 10.5, even though the Oxford only adds mere millimeters to the thickness of the iPad. Break it in! We used only the good stuff to make this iPad Air case. Thick full-grain American leather that breaks in over time and gets more beautiful with use. This high-quality leather starts off a little stiff and softens with use as it wraps your iPad in love for years to come. Welcome to the Pad & Quill Family!